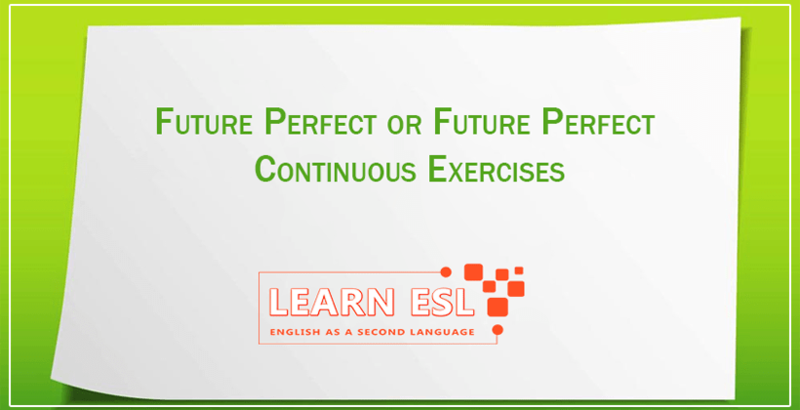 Do the future perfect or future perfect continuous exercises below by putting the verbs into the correct form, future continuous and future perfect. Jack: Have you been watching the Eco-Challenge on TV? Janet: Isn’t that exciting? It has got to be the most unbelievably difficult sporting event in the world. Jack: I know. By the time they finish the course, they (raft)_______________ more than 150 miles down a raging river, (hike)_____________ through 80 miles of jungle, (climb)_____________ a volcano and (kayak)_______________________ through shark-infested waters. Janet: And don’t forget that they (move) ________________________for at least eight days straight. Oliver: When are you going to get your bachelor’s degree, Anne? Anne: I am going to finish my degree next June. By the time I graduate, I (go)_________________ to four different colleges and universities, and I (study)_________________ for more than seven years. Oliver: Wow, that’s a long time! Anne: And I plan to continue on to get a Ph.D.
Oliver: Really? How long is that going to take? Anne: By the time I finally finish studying, I (be)_____________________ a student for over 13 years. Max: Sarah has been in the kitchen all day long. Jake: It doesn’t sound like she’s having a very good Thanksgiving. Max: She (cook)____________________ for over seven hours by the time everyone arrives for dinner this afternoon. Hopefully, she (finish) _______________________ everything by then. Jake: Maybe we should help her out. Mike: It’s 6:00, and I have been working on my essay for over three hours. Sid: Do you think you (finish)_________________ by 10:00? There’s a party at Donna’s tonight. Mike: I (complete, probably)______________ the essay by 10:00, but I (work)________________________ on it for more than seven hours, and I don’t think I am going to feel like going to a party. Fred: By the time they finish their trip across Yosemite National Park, they (hike) ________________________ for more than six days. Ginger: And they (be, not)______________________in a bed or (have)____________________________ a shower in almost a week! Fred: When we pick them up, they (eat)___________________________ camping food for days, and I am sure they will be starving. Ginger: I think we had a better plan on taking them directly to a restaurant.